Over time, oil paintings collect all manner of pollutants from the air which combine with aged varnish to reduce the clarity and colour intensity. We test a small area to establish which chemicals can gently lift the most dirt without affecting the underlying paint. We can repair structural damage on most kinds of supports including canvas, wood, metal, board and ivory. Holes can be repaired from the back using a linen or canvas patch. Larger damage, or weak canvases, are re-lined with new canvas, carefully applied with removeable adhesive or wax-resin mix. 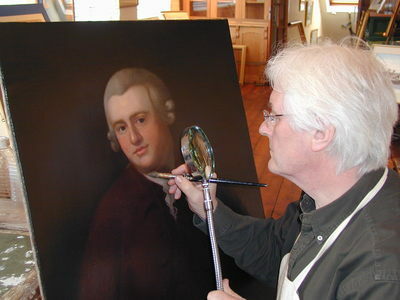 If damage leaves an area bare our restorer will retouch with oil paint to ensure a seamless repair. Brittle Canvas, crinkled and weak with age. Paint flaking from the surface.